Wine and Pop: Gravity Falls: "Irrational Treasure"
There are a number of shows on television right now that could be deemed hilarious, featuring great joke construction and brilliant comedic voices. The X-Files, Lost and numerous other shows introduced dense mythologies. Programs like Twin Peaks and Gilmore Girls have distinct locales, unlike anywhere that truly exists, but honest enough to feel authentic. Sitcoms for kids often throw morals onto the audience, imparting messages to the young viewers. How many shows, however, combine these elements (not to mention well-drawn characters, a big heart and incredibly detailed callbacks)? To my knowledge, there’s only one program that perfectly balances all of these incredibly distinct tones and styles, and there’s a good chance your little sister loves it. Gravity Falls debuted earlier this summer to solid ratings and much critical acclaim. Despite rave reviews, many “serious” TV fans have avoided it, given its home, The Disney Channel. This is fair, and I was skeptical after hearing a gaggle of ten-year-olds, my sister’s friends, mention its quality. They were right, and I was wrong, and I tuned in just in time to see Gravity Falls turn into perhaps the best show on television. Gravity Falls tells the tale of Dipper and Mabel Pines, a pair of twins sent to live with their great uncle, better known as Grunkle Stan, in the titular town. Stan owns a tourist trap called the Mystery Shack, full of obviously fake “wonders”. As the twins soon discover, however, the town is full of actual impossibilities, from gnomes, to ghosts to the 8 ½ president, encased in peanut brittle for self-preservation. The newest episode, “Irrational Treasure” is one of the show’s best outings, only losing out to “The Inconveniencing” which somehow combines an “acid trip”, a parody of hip-hop, and a fairly painful yet heartwarming tale of unrequited love. That episode focused on Dipper (voiced by Jason Ritter), whereas last night’s episode looks at Mabel, one of the best characters on TV right now, voiced by Kristen Schaal. Schaal is known for her work on Bob’s Burgers, Flight of the Conchords, and also for being one of the most incredibly talented people alive. 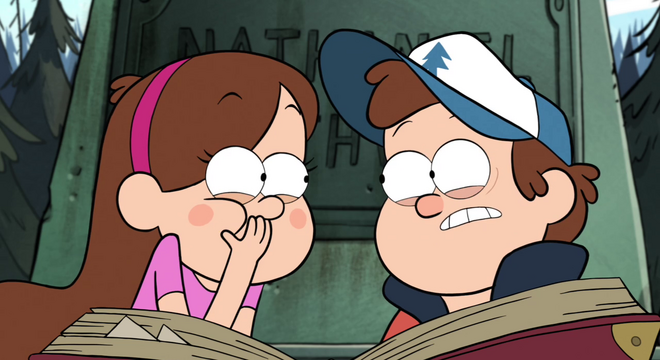 In “Irrational Treasure”, Mabel is mocked for how incredibly silly she is. We, the audience, know her antics are absolutely delightful, but the popular Pacifica Northwest thinks otherwise, and mocks Mabel in front of the entire town. From there, Dipper and Mabel set out to solve a conspiracy about Gravity Falls’ founder. Everyone believes said founder to be the great, great grandfather of Pacifica, but it turns out to be the aforementioned forgotten president. Once discovering this, they set the President free, and use his silliness, combined with Mabel’s, to save themselves from the hands of the government. Gravity Falls understands many things, from how to tell a joke, to the pains a young adolescent struggles through. It’s by combining these somewhat basic strands with each other, along with a constantly evolving mythology and other elements, that it becomes one of the two or three best shows on TV. Gravity Falls is a very silly show, but as “Irrational Treasure” taught us, that’s just one of the many things that makes it great. Also, this week’s episode featured an action setpiece on a train, which is favorite setting for any action setpiece. Next week’s episode concerns time travel. I think they’re writing this show explicitly for me. According to Twitter, Paul F. Tompkins will guest on the show soon. Still making it just for me. This week didn't feature Wendy, the older girl that Dipper loves, but that character is voiced by Linda Cardellini. Cardellini is best known for the playing Lindsay Weir on the program Freaks & Geeks, my favorite show of all time. Lindsay Weir was my first big fictional crush. And the trend of the showrunner thinking of me continues.